Nadeen and Gino recently moved out of the state. They were still having their wedding on October 7, 2017 back in Buffalo. They were coming back into town to finalize the wedding details and visit family. They also wanted to schedule their engagement session. Nadeen really wanted architecture and nature. She wanted to go to the Buffalo History Museum and Japanese Gardens. Little did she know, the Cherry Blossoms would be in bloom and it was going to be beautiful! While we were working around the area, we saw this opening. I thought it would be great to use because we had the blossoms and trees in foreground and the museum in the back. Neal was above with the couple and I was going take the image from a path below them. I wanted Nadeen to lead her fiance by the hand and walk by me! This was perfect! The colors looked amazing. There were pink and white cherry blossom in the front, bright green grass, and trees. Nadeen's vibrant dress worked out so good with everything. Gino had a simple light colored button down that complimented his wife to be's dress. I like to take images on the brighter side than Neal Urban. 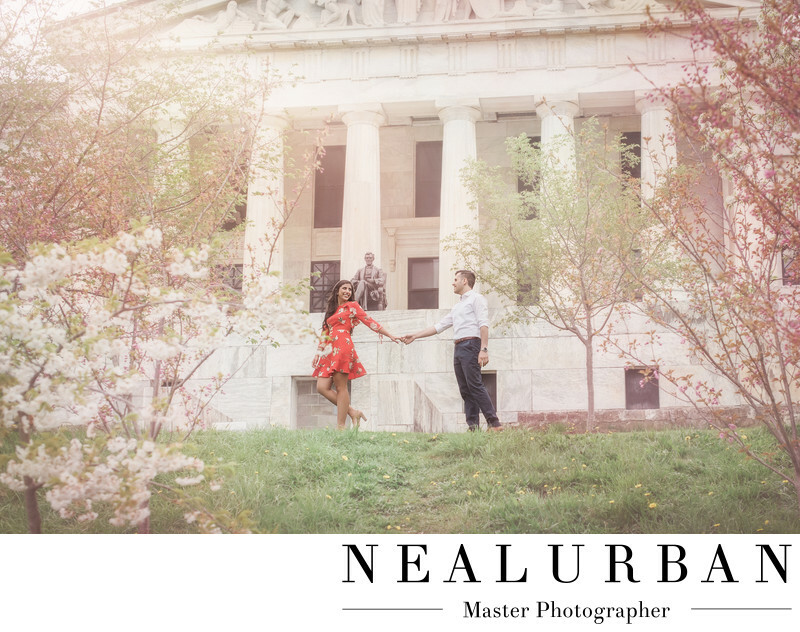 I love to use natural light, where as Neal is amazing with off camera and added lighting. We are able to give our couples two different styles of images. The wedding ceremony for this bride and groom is to be held at St. Joseph Cathedral in downtown Buffalo. The reception will be held at the Niagara Falls Country Club in Niagara Falls! Location: 1 Museum Ct, Buffalo, NY 14216.